Cistus ladanifer maculatus grows 5-6 feet tall and wide. The oils and resins from this rockrose are collected for their fragrance. 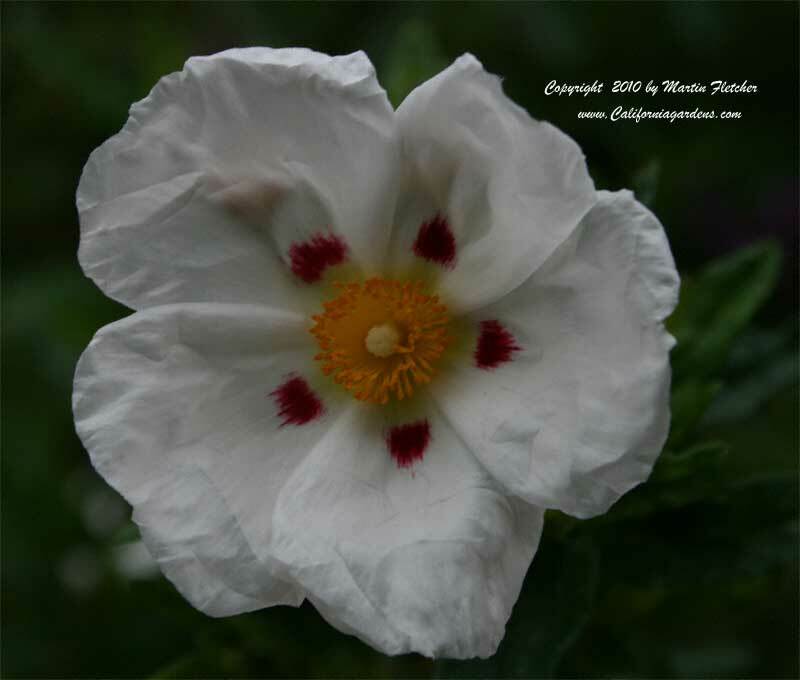 Cistus ladanifer maculatus produces 2-3" crisp white flowers with pink spots in the Spring. The rockroses are favored for a fire-scape planting. This variety being so tall should be back from the structure a bit. Cistus ladanifer maculatus is used in Biblical theme gardens. The Brown Eyed Rockrose will grow with little care and survive quite nicely on what nature gives us in the way of rain. The Brown Eyed Rock Rose requires moderate drainage and prefers full sun. Cistus ladanifer maculatus is Winter hardy into the low teens or maybe even a little below. Flowers and foliage of Cistus ladanifer maculatus the Brown Eyed Rockrose. High resolution photos are part of our garden image collection.